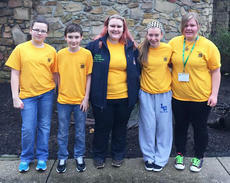 Middle school 4-H delegates from across the state recently attended the 10th annual Kentucky 4-H Summit at the Lake Cumberland Leadership Center in Jabez. The conference is held annually for those youth in grades 6-8 who want to learn more about Kentucky 4-H. The program is designed to encourage youth to continue their involvement in 4-H as they transition from middle to high school. 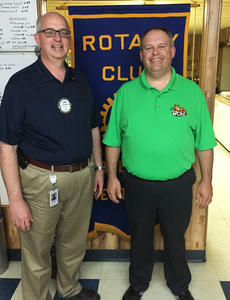 Rotarian John Skaggs, left, welcomed Cale Tharp from 94.3 the Wolf to Thursday’s Hodgenville club meeting. Cale was the guest speaker. 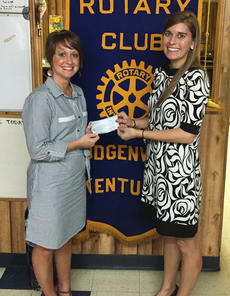 Katie McDowell, on behalf of the Hodgenville Rotary Club, presented a $630 check to Amber Lyvers of Feeding America. 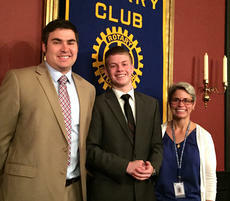 LaRue County High School senior Brian Anderson, middle, won the Elizabethtown sectional speech tournament March 27 while representing the Hodgenville Rotary Club. He will now move on to regional competition. At left is Rotary President Kyle Williamson. Speech Coach Katy Cecil is at right. 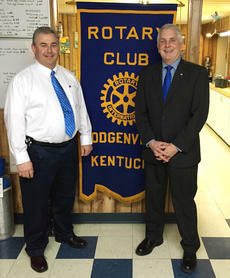 Hodgenville Rotarian Price Smith, left, welcomed special guest Carl Nathe to the March 26 meeting. Nathe is from the University of Kentucky public relations department and an announcer at Commonwealth Stadium. 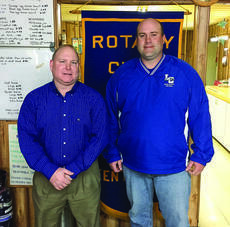 LaRue County High School Softball Coach Rocky Cundiff, right, was a guest at last week’s meeting of the Hodgenville Rotary Club. He is pictured with Rotarian DeWayne Murray. Winners of the Hodgenville Rotary Club Speech contest are from left, Kyle Williamson, Rotary president; first - Brian Anderson; third/alternate - Kaylan Anderson; and second - Elena Cecil. Anderson will represent the club when he competes March 27 in Elizabethtown. 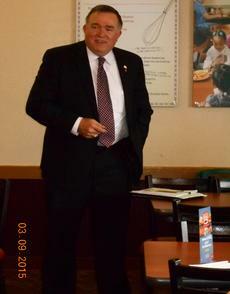 Hardin County PVA Danny Hutcherson spoke to the Kentucky Public Retirees - Lincoln Trail Chapter. The group will meet at 11:30 a.m. April 13 at Golden Corral in Elizabethtown with Lisa Pullin of Intrepid Home Health, speaker. 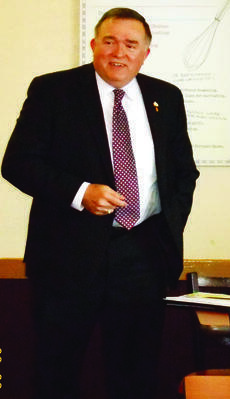 Hardin County PVA Danny Hutcherson spoke at the March meeting of Kentucky Public Retirees - Lincoln Trail Chapter. The group meets at 11:30 a.m. on the second Monday of each month. The April 13 meeting will be held at Golden Corral in Elizabethtown with Lisa Pullin of Intrepid Home Health as the speaker. 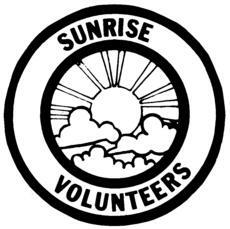 The executive board of the Sunrise Volunteers met Feb. 10 to discuss fundraisers and concerts. Also mentioned was how much the residents enjoy their new Bingo cards we provided for the sessions held twice weekly. The cards are senior friendly and very durable. Over the holidays, we gave T-shirts to each resident. Their names were written on the collar. Some residents have no family connections and a Christmas gift is a real blessing to them.